This article was originally published on Independent Australia on 8 July 2014. Why do corporate lobby groups like the IPA and fossil fuel front organisations like the Waubra Foundation retain ‘deductible gift recipient’ status, while genuine environmental charities like the Australian Conservation Foundation face having theirs stripped away by the Abbott Government. Sandi Keaneinvestigates. 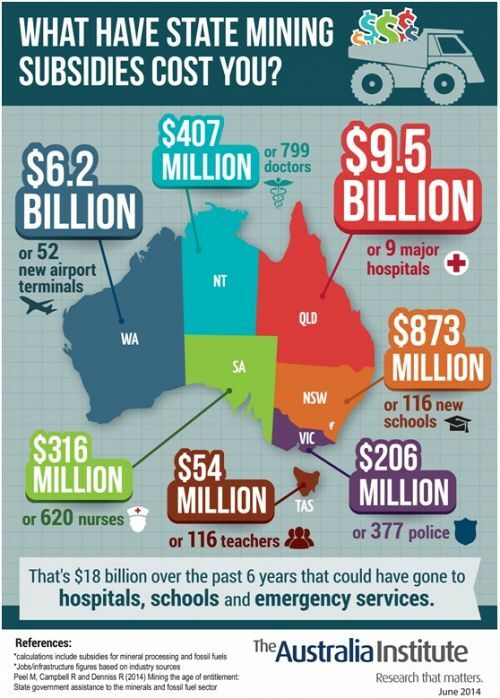 FOR AN ORGANISATION that has been touting ‘low taxes‘ for sixty years, the Institute of Public Affairs(IPA) sure delivers big on tax benefits to its major donors, especially Big Mining — which is already heavily subsidisedby Australia’s taxpayers (note graphic below right). Some, like Glencore, not only enjoy such subsidies but have no qualms about paying zero tax. These are the true “leaners” we tax-payers have to “lift”, as this article will show. If your product (such as coal and tobacco) results in harm to man, beast and/or planet, why risk being mauled by the mob when you can hire a pressure group like the IPA to fudge the facts? Furthermore, your donation is tax deductible! In 1987 the IPA restructured itself as a company limited by guarantee, which means that its directors are not liable for any debts it might incur. The restructure enabled it to apply to become an Approved Research Institute (ARI) and thus be eligible for endorsement as a deductible gift recipient (DGR). In other words, donors to the Institute would be able to claim a tax deduction for their donations. DGR status is the most valuable asset of an organisation like the IPA because without it virtually no-one would donate. So, when the IPA are out there spinning the facts on climate change, tobacco or GMO foods, we, the taxpayers, are subsidising the service through tax-deductions for IPA’s donors as well as providing free carriage of their message on our taxpayer-funded ABC. The IPA’s media savvy guarantees a positive sound bite and millions of dollars of free publicity as a ‘credible commentator’. The most egregious example of this is the use of taxpayer-funded ABC as a vehicle. How often does the IPA appear on ABC’s The Drum, Q&A, 7.30, Lateline and ABC Radio National to hammer home its paymasters’ agendas? That’s wall-to-wall media exposure for starters. Not a bad return on your investment? A good example of this, as I have written, was when former IPA pin-up boy Tim Wilson stormed the airwaves trying to scare the public witless about the Gillard Government’s audacious plain packaging plan. But we don’t even know the exact tax-leaners for whom the IPA are spin-doctoring, since the IPA guarantees anonymity. In 2003, the Australian [Howard] Government paid $50,000 to the Institute of Public Affairs to review the accountability of NGOs. The latest truly breathtaking rort is tax deductibility for donations to fund the new IPA-promoted misinformation manual, Climate Change: The Facts 2014. Like previous books, it attacks climate science, carbon pricing and renewable energy targets. The usual line-up of neo-lib nostrums, climate contrarians and carpetbaggers feature: Ian Plimer, Andrew Bolt, James Delingpole et al — each looking more like Comical Ali every day, rabidly denying the bleeding obvious and getting funded by the taxpayer to do so. It is nothing short of perverse. In order for the IPA to become a DGR it had to apply to the Secretary of what is now the Federal Department of Innovation, Industry, Science and Research giving various undertakings. Most importantly, it had to undertake to use all tax-deductible donations exclusively for scientific research,more particularly, “scientific research which is, or may prove to be, of value to Australia”. In this context, the authorities have ruled that “scientific research” includes social scientific research…. All of this raises the question of whether donations to the IPA for which the donor has claimed a tax deduction are being used in compliance with the law. But here’s the real rub. Along with moving to abolish the Renewable Energy Target, carbon price, Clean Energy Finance Corporation, Climate Change Authority and the Australian Renewable Energy Agency, the Liberal Party now wants to gag environment groups. This was kind of inevitable after the Queensland LNP voted to ban the teaching of climate science in the schools because it “poisoned children’s minds”. Really. Now the Abbott government plans to abolish tax-deductibility for genuine charity organisations like the Australian Conservation Foundation, Friends of the Earthand The Wilderness Society. Why? As stupid as this may sound, because these groups are engaging in activism! Obviously, climate denialism is “good” activism, while climate action is “bad” activism and deserves punishment in the upside down world of Tony ‘Mad Hatter’ Abbott’s Tea Party. But I really do need to clear the pigs for take-off when it comes to the Waubra Foundation. Just as the IPA peddles climate skepticism, the ‘astroturf’ front Waubra Foundation peddles propaganda about wind farms. Like the mining-funded IPA wants to stop regulation on the big polluters, the Waubra Foundation wants to stop wind farms replacing coal-fired power. Its chairman, Peter Mitchell, who made his fortune from mining, also set up theAustralian Landscape Guardians. The Pecksniffian-sounding “Guardians”, Waubra Foundation and Mitchell’s investment company, Lowell Resources Funds Management Limited all share the same address and P.O. Box in South Melbourne. Only a halfwit could take seriously the Waubra Foundation’s totally-debunked claims, through at least 22 reviews, about ‘wind turbine syndrome'(WTS) — a concocted illness, unheard of in the northern hemisphere where they’ve had wind farms for forty years. This year, the National Health Medical Research Council again found there was no reliable evidence that proximity to wind farms directly caused health effects. This conclusion was supported by the Australian Medical Association. Professor Simon Chapman believes WTS is a classic psychogenic illness. He has written widely on the “nocebo effect”. In effect, wherever Waubra’s ‘medical director’ Sarah Laurie goes on her fear and smear campaign, the ‘disease’ follows in her wake. Seriously, ATO, are you kidding? When these anti-wind activists (there’s that word again) used tax-deductible donations from you-know-who to start funding campaigns against wind farms, outrage broke out amongst the Greens, Labor and environment groups. The Australian Tax Office and the Australian Charities and Not For Profit Commission (now about to get the chop from the Abbott government in its rampage against all regulators) are now reviewing Waubra’s charity status. Change is only possible if people are informed about the facts. Social media is the most effective tool to get the word out. If you are outraged by the unfairness of mining-funded spin outfits getting charity status whilst environment groups face losing theirs, compel the ATO to respond by lodging an official complaint. Update: As a result of a campaign by the Greens and work of investigative journalists like Sandi Keane, the Waubra Foundation had its charitable tax status revoked in December 2014, five months after this article was published. 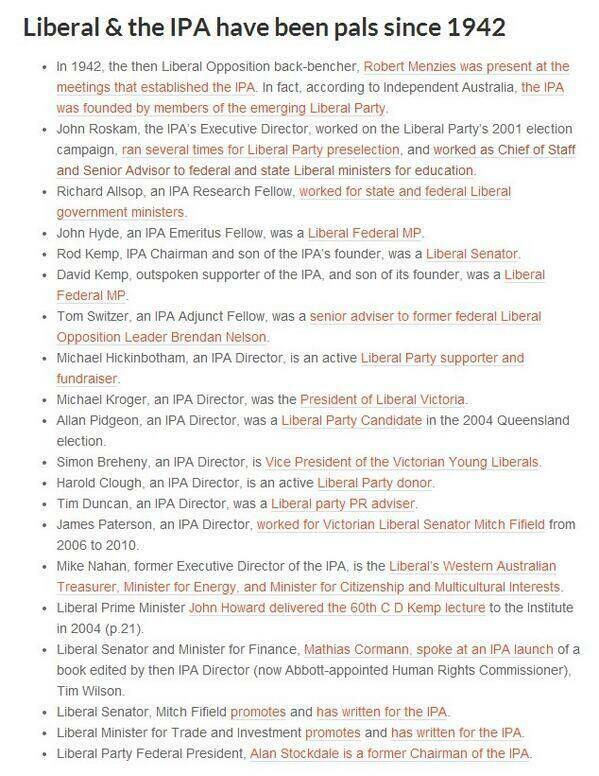 #lateline The #lieberals not a charity – what about the IPA? This entry was posted in Climate Change, Finance, Mining, Politics, PR Spin by skepticslayer. Bookmark the permalink.